Ananas Phuket Hostels Thailand chic hostel has breathed new life and style into the city's attractive of area. The first chic hostel in Southeast Asia. Ananas a representation of the pineapple it the famous fruit of Phuket, whether you are visit Thailand for business or travel by yourself or as member of a group, Ananas present you a luxury on a budget yet comfortable accommodation in Phuket. Ananass may complete you In The way of Chic(back)Packer!! 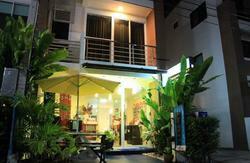 Ananas Phuket Hostel, is the newly open hostel in Phuket Town. The hostel located on Surin Road, at Phuket@Town Village approximately 500 meters from Phuket Bus Terminal 1.